These aren’t the summer camps of your childhood, where your parents shipped you away for four months with a knapsack on your back. Summer programs for high school students tend to focus on a particular interest, so you spend a lot of time just doing what you love to do, whether it’s playing in a chemistry lab or on a soccer field. Many last only a week or two, but that week could change your life—no campfires, marshmallows, or sing-alongs required. Summer programs with an academic tilt give students a preview of the college/university experience and may even earn some college credits. And when it finally comes time to apply for colleges, that summer spent acting or studying geology or writing will look great on the application. It shows the kind of passion and initiative admission counselors love to see. There are lots of camps out there to choose from, some local and some with a national or even international draw. But finding the right one for you is actually pretty easy. Just think about what you like to do, from studying astronomy to synchronized swimming—whatever it is, there’s bound to be a camp out there, somewhere! Search the Web for your interests, plus “summer camp.” Add your state to the search if you want to stay close to home. (“Art” plus “summer camp” plus “Michigan” yields over 250,000 Google results!) Websites like summerprogramsearch.com, mysummercamps.com, and teencamps.com and books like Guide to Summer Camps and Summer Schools (Porter Sargent Handbooks) are great resources too. 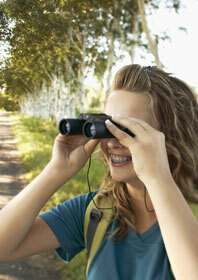 High school guidance offices often post lists of cool camps in the spring as well, so don’t forget to check there. But no matter where you look, read the descriptions and keep track of the ones that look fun. Start the search around winter vacation so you can apply early to better your chances of getting into your top-choice program. Recent college graduate Ben Fickett remembers camping with his family when he was younger, but he says he never really got the point until one summer vacation in New Hampshire’s White Mountains. “The self-sufficiency and the rugged beauty of the Whites really got to me,” he says. “I wound up seeking camps with more outdoor experiences and eventually stumbled on to White Mountain High Adventure Base.” Fickett joined the program, which runs summer kayaking, rock climbing, and hiking trips, among others, throughout New Hampshire and Maine. After two trips as a WMHAB camper, Fickett joined their staff development program. He became a field leader at 17 years old, a job most guides don’t have until they’re 21. “I remember meeting the guides and being amazed that people could get paid to do that kind of thing and that most of them had gone to college for it,” Fickett says. “I wanted to have experiences like theirs.” That love of outdoor education eventually led him to the University of New Hampshire, where he graduated in 2009 with a degree in kinesiology and a concentration in outdoor ed. He then took a job with Outward Bound, a nonprofit organization that’s all about outdoor learning expeditions. Maybe you’re not into the outdoorsy stuff. That’s okay too. These programs are about exploring your interests and gearing up for college, and the college preview starts as early as the camp application process. With most academic summer camps, students should expect to submit an application very similar to a college application, with short-answer questions, teacher or counselor recommendations, a school transcript, and standardized test scores. Camp admission counselors may also look for a student’s aptitude for the subject at hand, like an interest in science or a writing sample. So if you’re applying to a computer science camp and you taught yourself 11 different programming languages just for fun, that’s something you should share! “It’s a very rigorous application process,” says Kathy Frame, a staff member at the Center for Excellence in Education. One of their programs is the Research Science Institute, a very selective free summer camp at the Massachusetts Institute of Technology. Admission counselors take into account not just academics, but applicants’ social life and volunteer efforts too. Other selective programs do the same, but because they look at so many different factors, there is no set formula for getting in (a lot like the most selective colleges in the country). “Do as well as you can on your national tests and do extracurriculars while in school,” Frame recommends. A well-rounded application can make up for less-then-stellar PSAT scores. And don’t forget to read the application carefully and check for errors when you’re done! If you’re applying to art, music, or theater camps, you will probably need to send in samples of your work. Make sure you give them your absolute best stuff. And when you’re done tweaking and perfecting that demo or short story, turn to people you trust, including teachers, to help you make your best even better. While this may seem like a lot of effort for a summer camp, if you’re thinking about applying to art/music/theater schools, it’s exactly what you will encounter, so why not practice now? Deep in the southwest, there is a group of intrepid scientists tracking the asteroids whizzing above the Earth. They just happen to be campers at the Summer Science Program in California and New Mexico. The camp gives high school students a chance to live and study on a college campus, where they work on research projects related to celestial mechanics. Executive Director Richard Bowdon says students are surprised when they arrive at SSP. “First—that the other students are so smart, interesting, and friendly. Second—they can learn so much so fast and have so much fun at the same time,” he says. “We tell them these things, but they never believe it, because high school is not like this! Camp coordinators try to “mix it up,” Little says, with trips to interesting businesses. Camp $tart-Up took students to a jet propulsion lab to investigate the facilities and learn about the business behind launching people into space. Another trip brought them to Frida’s Fresh Marketplace, a farmers market near Los Angeles, where they explored behind the scenes and, naturally, sampled lots of products. “There’s a lot of fun as well as academic classroom experiences.” Plus, camps like these still have games, trips to the beach, and plenty of social time. “Camp can also be a vacation. Even the academic ones have fun elements,” says Annette M. Packard, Program Coordinator for the Women in Engineering summer program at the University of Dayton in Ohio. At WIE, young women spend six days exploring all the basic divisions of engineering: mechanical, industrial, civil, computer, etc. Michelle Whelan first attended WIE the summer after her sophomore year of high school. She didn’t know anyone else who was going, and she was nervous. “It was a very intimidating camp,” she says. “A lot of hands-on experience followed by lectures . . . much different than anything we had in high school.” But Whelan found she was surrounded by young women just like her. “We all had the same interests,” she says, and no one was embarrassed to like science! Engineering professors described what their specialties were all about, and students learned through lectures and projects. Activities included building a balsa wood bridge in a civil engineering course, making soap in a chemical engineering class, and testing materials in university labs. The Iowa Young Writers’ Studio is a summer program for students who really love to write, says program Director Stephen Lovely. “They can expect to spend two weeks completely immersed in the world of writing,” he says. “They kind of leave their world behind.” It takes place at the University of Iowa, a school known for the strength of its writing program, and the camp offers a collegiate experience, but in miniature. Like the Writer’s Studio, many camps are held on college campuses, and students stay in the dorms, getting a great preview of life after high school. “They’re really experiencing college for the first time,” Lovely says. Another similar aspect is the need for financial aid; a lot of students can’t attend summer programs without it. “Many programs offer scholarship opportunities,” Packard says, some need-based, some merit-based. “Don't be afraid to ask.” Just apply as soon as possible, because awards are often limited. “No one should let financial considerations stop them from applying!” says Bowden. When summer camp comes to an end and you finally sit down to fill out those college applications, you will have a wealth of experience to draw from and great stories to tell. Instead of saying “I like marine biology,” you could talk about the three weeks you spent studying finback whales off the coast of Maine. All of this experience is great, but there is one more phenomenal benefit to attending a summer program, and it’s not the experience for your résumé or the new pages in your portfolio.